You will have to hurry for this one. There will be an off-road trip organized by the Off Road magazine September 10-12th in the Kanchanaburi area. Entry fee is B. 3,000 with all meals provided by the organizer. You have to bring your own tent and your own 4 x 4 Offroader, as it is camping out in the jungle. The organizers promise plenty of exciting off-roading. 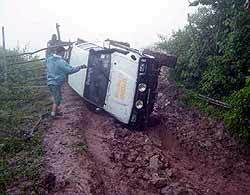 Mud tyres are mandatory as most of the tracks at this time of the year will be muddy and slippery. Entries are limited to a maximum of 20 cars, so the organizers say to ring today! More details can be obtained from Off Road magazine (Tel 02 522 1731-36, Ext. 356 or 357) or from my old friend Capt. Sitthichoke on 01 864 2270, or email offshoremarine @csloxinfo.com and [email protected] The good sea captain speaks English and is an experienced off-roader, who would never let this situation happen to you! I must admit I have only ever seen one A Class in my life. There are not too many kicking around Thailand but the one I saw was at the Bira circuit. Even when I was in the UK 12 months ago I did not see any in the supermarket car parks. It seemed as though they were not the flavour of the month. My walk around the one at Bira revealed that it was much bigger than I imagined, and much taller as well. I was left with the thought that DaimlerChrysler must have designed them for carrying giraffes (or was it elks). However, our Down-Under correspondent John Weinthal has just spent a week with an A Class and found himself alphabetically challenged. Here are the Words from Weinthal. “Driving the Mercedes Benz A Class baby car I pondered what the A might allude to: Attractive - surely only to the blind; Agile - sorry, it has the responses of a three-legged turtle; Absurd - let’s not be too harsh in our introduction. Finally I settled for Alternative, as in eccentric, but without the Allure of many of that ilk. “The A Class was originally launched in late 1997, then re-launched following a delay of some months after the infamous roll-over by a Scandinavian review team in their so-called Elk Test manoeuvre. “After this incident which attracted worldwide publicity, Mercedes went back to their drawing boards to re-engineer the suspension, no doubt to enhance the life expectancy of these northern beasties. “The A Class never recovered from this exercise which dulled the steering, stiffened the ride and made the car rather listless if not quite lifeless. Beyond that, there is the rear side styling with its quirky over and under windows and upswept rear door window line, both of which were possibly adopted to hide an essentially ultra-short wheelbase station wagon profile. 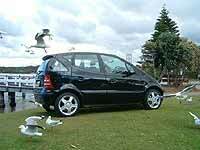 “I have driven a few A Class Mercs over the years belonging to three friends. Significantly, none had been for a test drive, and each sold them for substantially less than the new price within a year of purchase. “It took Mercedes six years to reach the one million production figure - the only surprise is that they have persevered for so long. But persevere they have. We will see a second generation A Class here around next May. For the first time there is a three-door and the five-door looks much more conventional. “The engines are claimed to be 38 percent more powerful and 10 percent more fuel efficient. There is also a 142 kW turbo model and, for Europe at least, the choice of three four-cylinder diesels. “The new cars are wider and longer with substantially changed underpinnings which is hardly surprising! In Australia the original A Class now comes in a variety of trim specs with short and not-so-short wheelbase versions powered by either 75 kW 1.6 litre or 92 kW 1.9 litre four cylinder engines. “A Class is available with a five speed manual or sophisticated five-speed automatic transmission. The test car was a short wheelbase automatic 1.6 in Piccadilly trim specification - a special edition costing AUD 36,690 (around 1.2 million baht at straight currency conversion) with the auto shifter. Piccadilly distinctions include floor mats, choice of metallic black or blue paint, a leather clad steering wheel and gear knob plus a couple of Piccadilly badges. “The major claimed attractions of the A Class are large interiors for their external dimensions, folding and removable seats for load carrying flexibility and accident safety which is claimed to match that of the larger conventional C Class sedans. While these claims may be reasonable what do they mean in the real world? “If I want more space I will buy a larger car - or, for genuine practicality within still compact dimensions, one of the many soft off-roaders most of which cost less than the 1115 kg A Class and offer more space plus better ride, handling and outright performance. “For the asking price (in Australia) the A Class is pretty basic in its equipment levels. There’s no power operation for the rear windows, no fast up or down for the fronts, no auto lights or wipers, no remote controls for the audio and a glove-box without a lock. “It does have air-conditioning, cruise control and a height adjustable driver’s seat. There are front and side airbags for the front seat occupants, electronic traction control, ABS brakes and brake assist. You get all this and heaps more on a new V6 Hyundai Tucson plus the safety of all-wheel-drive. And the Tucson costs just under AUD 30,000 (but unfortunately not available in Thailand)! “Over a two hour drive the A Class seats proved to be real bum-numbers. The auto change is lethargic. The steering is less than communicative and weights up as lock is increased. There is considerable body roll on moderate corners. Engine and other noise sources are about average for a hard working 1.6 litre auto as it struggles to maintain even Australia’s absurdly low speed limits in hilly terrain - and that’s with only the driver aboard. The distinctly downmarket look and feel of the drab purple plastics and leather of the A Class did nothing to raise the spirits, nor does its very basic instrument cluster. “If I must have a high roof sedan with a ski slope nose I would grab a Daewoo Matiz for less than half the money (not available in Thailand) or move upmarket from the lively and fun Daewoo to something like the classy looking new Mitsubishi Colt (not available) or a Honda Jazz (reviewed a couple of weeks ago and retailing here around 600,000 baht). “In my opinion each of this trio has a better look and feel to the interior and more endearing exterior styling. That’s before one considers the excellent Mazda3 and Mazda6 and a host of other sub-AUD 35,000 cars which, by any objective standard, represent outstandingly better value and more rewarding motoring than this A Class Aberration. One does not have to screw one’s eyes up too much to read between the lines that John Weinthal was not altogether impressed by this vehicle, so perhaps it’s good that we don’t get the A Class here. Both the A Class and the smaller Smart would cost too much in this country to be saleable items; however, judging by John Weinthal’s test, the A Class is hardly saleable in Australia either! Last week I published the photograph of this woman. I wrote that she has probably influenced automotive history more than any other woman in the world, and I asked who was she? I wanted her first and last names. 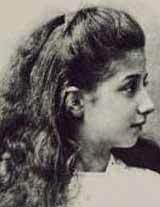 The answer was Mercedes Jellinek, from where we get the Mercedes car. Interestingly, she had a sister called Maja, and some Daimlers were sold in Austria as Maja’s. Now that’s a real piece of autotrivia! She was not related to either Karl Benz or Gottleib Daimler. So to this week. In an attempt to stymie the ‘googlers’ let’s do a “Who Am I?” I have a mid-mounted 3.5 litre, six cylinder engine developing close to 300 bhp. I was supposed to be built in Italy, but ended up in Germany. Only 450 examples of me were ever made. Each one was a two door coupe. Who am I? What did we learn from the Belgian GP? It was also a much better GP, in the fact that we actually witnessed some “racing” with passing manoeuvres and even some wheel banging. Hooray! The carnage on the first lap was something we could have done without, with about five cars outed immediately. I can see rolling starts, a la American racing coming in. There were also too many safety car periods for my liking. Sure it bunches the cars up, but it is all very artificial. Having said that, when I was racing I was always glad of a safety car period, unless I was in the leading car! The ‘losers’ were Pizzonia and Zonta. It wasn’t South America’s day. Pizzonia, desperately trying to show he is worthy of a race seat was well on the way to a podium finish when his Williams just stopped with only a few laps to go. He had raced well up to that point. Zonta, from 20th on the grid had also done a fantastic job only to have his engine let go. Montoya won no fans by getting out of his car and opting to go for a shower, despite the punctured rear tyre being replaced, while Coulthard did win fans by continuing on, despite a puncture and a collision, and finished in the points. The next race is at Monza in Italy next weekend.